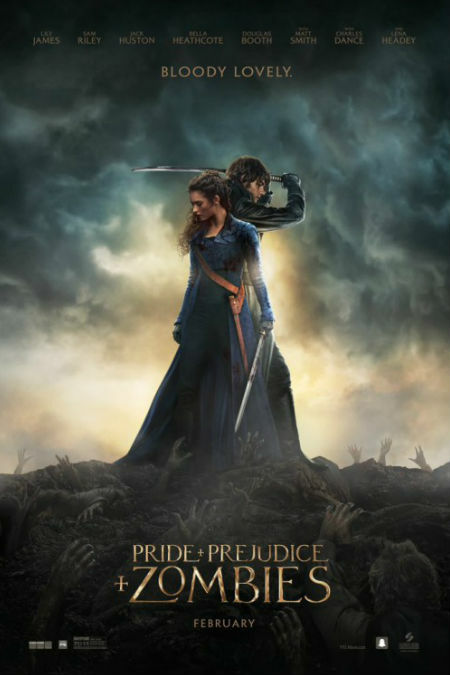 And so is set the template for the movie adaptation of Seth Graham-Smith’s Jane Austen mash-up Pride Prejudice and Zombies which neatly blends Austen’s unorthodox, gently satricial take on the mores of nineteenth-centre upper crust English romance with the far more modern obsession with undead apocalypses. The sheer inventiveness of the book looks to have been captured perfectly in its cinematic companion with the Bennet women more than capable thank you very much of looking after themselves, both on and off the battlefield. What makes this new trailer so damn enjoyable is the way it shows each and every Bennet sister, all of whom would make a fine catch for any man looking to fend off the undead, going hard at it without a curl out of place and only the merest of disruptions to a tightly-set bodice. These ladies know what they’re doing and if you’re zombie, you would do well to get out of their way and fast. If you’re a potential suitor, do not, by an means, underestimate the Bennets – raised for battle, they are instinctive warriors far more apt to do the saving than need saving themselves. Mr Darcy you have been so warned. Pride Prejudice and Zombies opens in USA 5 February 2016 and Australia 25 February.